DVD Synopsis: His crime: nonconformity. His sentence: the chain gang. Paul Newman plays one of his best loved roles as Cool Hand Luke, the loner who won't – or can't – bend to the arbitrary rules of his captivity. A cast of fine actors, including George Kennedy in his Oscar-winning role of Dragline and the indelible Jo Van Fleet as Luke's mother, give Newman solid support. And Strother Martin is the Captain who taunts Luke with the now legendary line, "What we've got here is...failure to communicate." No failure here. With rich humor and vibrant storytelling power, Cool Hand Luke succeeds resoundingly. 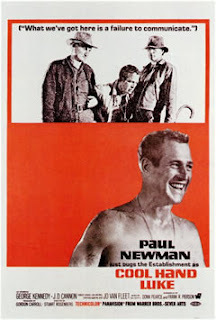 Rebellion was a common theme in the films of the late 60’s and early 70’s, yet none of the cinematic rebels of that time was quite like Cool Hand Luke. As played by Paul Newman (who conveys more with a simple smile than most might with pages of dialogue), Luke wasn’t interested in setting the world on fire, and he wasn’t looking for truth, justice or the American way. In fact, it seemed to me that all Luke really wanted was to be left alone. While watching Cool Hand Luke, I was reminded of another movie rebel, Jack Nicholson’s Randall P. McMurphy from the 1975 award-winning film, One Flew over the Cuckoo’s Nest. Like Luke, McMurphy entered a situation of quiet complacency and proceeded to turn everything upside-down. But where McMurphy fought the system by shouting at it, Luke did it all pretty quietly, never shaking his fist or making big speeches. His fellow inmates liked to say that Luke was a real world shaker, but the truth is Luke just kinda stood still; it was the world around him that did the shaking.